But nine times out of ten when you draw a blank in analytic geometry or calculus, you'll find that your trouble is caused by weakness in algebraic manipulation." That statement is not a major factor in the plot, but it does ring true in a familiar way. I remember noting that the guys who had trouble in calculus class usually did so because they were weak in basic algebra and trigonometry. An engineering calculus class moves at such a rapid pace, with many new concepts thrown at you every day, that you absolutely must not have to learn algebra and trig concurrently. My high school algebra skills were pathetic, so prior to taking my first calculus course I took not only an algebra course but also a precalculus course that taught trig identities, complex numbers, and logarithms. I am convinced that without mastering those skills first, I could not have earned "As" in all my calculus courses that followed. While I'm self-indulging, let me also mention having been introduced to the word 'alacrity.' OK, on to the storyline. Carl and Jerry build a minimum component FM radio using a tunnel diode and a transistor, along with a handful of Rs,. Ls, and Cs. Outside it was a sizzling hot day, but Carl and Jerry were sitting in the comparative coolness of their basement laboratory boning up on algebra. Although this might seem like a strange activity for a couple of boys who had graduated from high school only a month before, there was a good reason for it. Older boys drifting back from college for summer vacation had passed the "word." "Sharpen up your algebra! College math," they said, "is really tough. Assignments there are three or four times as long as high school assignments, and you'll have no time to catch up on fuzzy fundamentals. But nine times out of ten when you draw a blank in analytic geometry or calculus, you'll find that your trouble is caused by weakness in algebraic manipulation." Carl and Jerry immediately dug out their algebra books and started going through them right from the beginning, each working the exercises independently. When their answers did not match, they examined their respective solutions until the mistake was found. They both pledged to complete the review before leaving for college in the fall. But the boys were only human; so they dropped their books with alacrity when they heard a knock at the outside door and saw the outline of a visitor looming through the screen. A huge man, well over six feet, stepped inside at Jerry's invitation and stood in the middle of the floor mopping his brow. "My name is Cody," he announced slowly in a deep voice as though he had rehearsed every word. "I work for an agency of the federal government - it's not necessary for you to know which one ... I have a problem, and Police Chief Morton thinks you may be able to help me. I doubt it; but if you will come with me, I'll show it to you." He was already walking back through the doorway as he finished speaking. Jerry and Carl, exchanging puzzled glances, followed him to a small foreign car standing at the curb. He was so big and the car so tiny that it seemed he did not so much get into the car as put it on. After a glance at the well-occupied front seat, the boys got in the back; and the stranger drove silently and rapidly out of town along the highway leading west. About five miles from town he pulled off on a seldom-traveled side road and stopped beside a heavy growth of trees. "We have to go through the woods on foot," he announced, displaying surprising agility as he climbed over the rail fence bordering the road. He began to walk so swiftly that the boys almost had to trot to keep up with him; yet those big square-toed shoes never snapped a twig or dislodged a noise-making pebble. 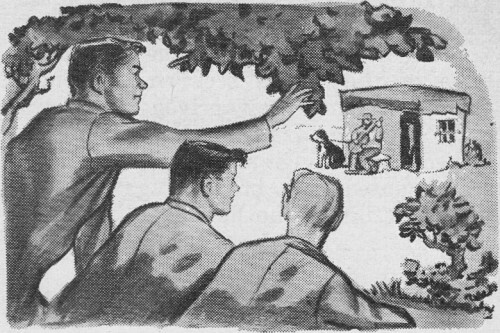 After a twenty-minute trek, the stranger motioned the boys to be silent and tested the wind direction with a moistened forefinger. Then he lead them in a big semicircle, dropped to his knees, and crawled toward the top of a small knoll. Carl and Jerry, becoming more intrigued by the moment, slithered along beside him. Finally the big man stopped, and pointed down through some low bushes at a small tar-paper shack standing in a clearing not more than a hundred feet away. A short, fat, bearded man was sitting on a low bench beside the open door playing a guitar; and lying at his feet was the reason the government man wanted the wind to be blowing from the cabin toward them. It was the largest, roughest-looking Saint Bernard dog the boys had ever seen. A stout chain went from the dog's broad leather collar to an iron stake driven into the earth near the door. "There's my problem," Mr. Cody said in a hoarse whisper. "The man is the leader of a communist-backed group trying to overthrow a government friendly to us. I have information that two of his lieutenants may arrive at any hour for an important meeting. It's most essential that I hear what's said at that meeting; but how? No one can bug the shack with that dog on guard, and he and the man are always together. Even if I could hide a mike in the shack, the conversation might take place outside where it's cooler." "I always thought Saint Bernards were kindly dogs that brought you a keg of brandy when you were lost in the snow," Carl muttered. "This one probably never saw those cartoons," the big man said with a trace of a grin. "He's as mean as they come. When the man hears anything suspicious, he turns the dog loose; and I'd as soon have a timber wolf after me." "Wish I could see a little better," Jerry whispered. "I'm getting an idea." Silently, Mr. Cody took a small telescope from his pocket and handed it to Jerry. The latter focused it carefully on the dog for a few seconds, then handed it back. "If you'll take us back to town to pick up some equipment, I think we can fix you up," he said confidently. The large man looked at the youth steadily for a moment, then turned around and started crawling down the slope. On the way to the car, Jerry outlined his plan. "My idea is to conceal a tiny FM transmitter inside the dog's collar. That collar fits loosely, and there's plenty of room for the transmitter I have in mind. You know what I'm talking about, Carl. It's that little tunnel-diode job we built from plans in the fifth edition of G.E. 's Transistor Manual. In addition to the diode and a transistor, all it uses are a few resistors and capacitors, a mike, and a coil. 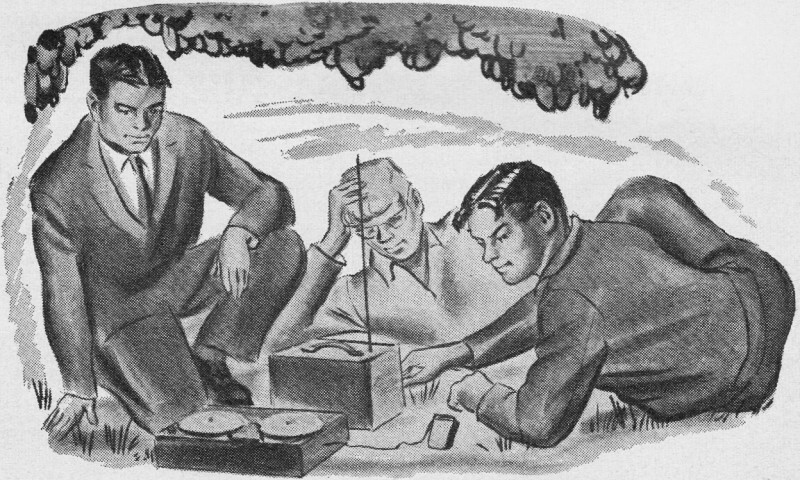 We'll pick up the transmitter on Carl's transistorized FM receiver. Since you say the dog and the man are always together, we should be able to overhear the conversation no matter where it takes place." "I'll have to take your word about what will work electronically - Morton claims you know your stuff," the federal man said as they got into the car; "but aren't you forgetting something? How are you going to get the collar off the dog to install the transmitter? I'd rather try to change the rattles on a diamond-back snake." "That's why I want to go see Doc Andrews, the veterinarian, first," Jerry. declared, with an enigmatic look. Two could play at this close-mouthed business! Back in town, Jerry asked Doctor Andrews if he had a Cap-Chur pistol. When he said he did, Jerry asked if they could borrow it and a couple of charges that would immobilize a hundred-pound dog. The doctor balked at this, but the federal man took him over into a corner and showed him something in his wallet. From that moment on, the veterinarian cooperated fully. He charged a couple of syringes with 300 milligrams each of a nicotine alkaloid drug and explained how the pistol was to be used. 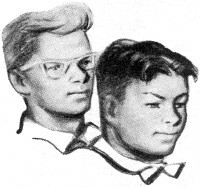 Mr. Cody then dropped Carl and Jerry off at their laboratory, saying that he would be back in half an hour. The first thing the boys did was to arrange their tunnel-diode transmitter on a flat metal sheet that could be fastened inside the dog's collar. By the time they had collected Carl's transistor FM receiver, Jerry's battery-operated tape recorder, a leather punch and some soft brass rivets, the little car was standing at the curb again. Their impatience made the trip to the edge of the woods seem much longer this time. When they arrived, the federal man lifted a grain sack - which contained something alive that squealed and grunted - out of the luggage compartment under the hood. "What's with the little pig?" Carl asked. "You'll see - maybe," the big fellow replied as he slung the sack over his shoulder and headed into the woods. When they arrived at their former vantage point, both the fat little man and his dog were apparently dozing. "I'll stay here," Mr. Cody stated. "You two go around to the other side of the clearing and take care of the dog. When he scents you, he'll make a fuss and the man will turn him loose. Let him chase you back into the woods out of sight before you shoot him." "I like that," Carl said as they started working their way around the clearing. "We do the dirty work. What's the dope on this Cap-Chur pistol, anyway?" "The projectile is actually an automatic hypodermic syringe. When compressed CO2 shoots it from the barrel of the pistol, a brass plug sealing an opening at the back of the hollow rubber plunger is dislodged by inertia, exposing gas-generating tablets inside the plunger to the action of water. A collar on the syringe needle allows it to penetrate the skin of the animal to just the right depth; then the gas generated by the tablets forces the plunger forward and injects the drug into the muscular tissues. The pistol and a similar longer-range rifle are used a lot by veterinarians, stock raisers, dog-catchers, and so on. 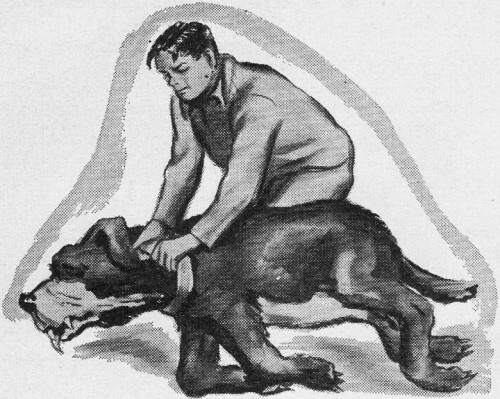 "Try to hit the dog right behind his rib cage," was Jerry's final instruction. "Above all, don't miss!" When they reached the edge of the clearing, the dog had awakened and was gnawing on some bloody beef ribs. Every time he cracked one of the bones with his powerful jaws, Carl winced. Suddenly the animal rose to his feet, sniffed the air suspiciously, and began to growl. "What's wrong, Judas? Somebody out there ?" the little man asked as he reached over and unsnapped the chain. "Go get 'em!" Carl and Jerry were already fading back into the woods, and the dog came bounding straight toward them. Each boy scrambled up into the branches of a small tree. 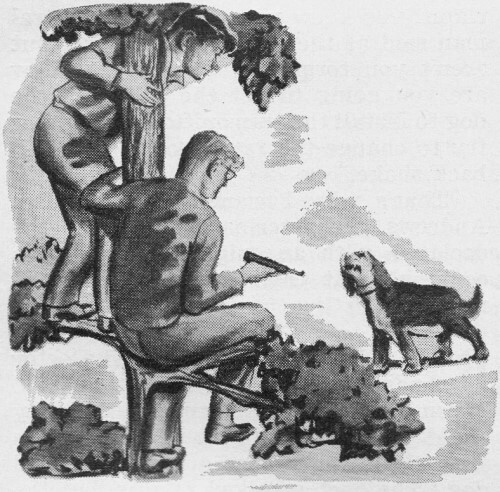 As the dog stopped beneath them, raised his blood-stained muzzle into the air, and peered at them with bloodshot eyes, Carl took careful aim with the pistol and pulled the trigger. There was a little "ph-t-t-t" of sound, the dog jumped, and a tuft of yarn fastened to the back of the Cap-Chur projectile to keep it flying point-foremost appeared in the dog's coat a hand-span ahead of his hip bone. Almost at once his head sank; he staggered drunkenly about, and then rolled over on his side. Quickly Jerry slid out of his tree and gingerly started unfastening the collar from the unconscious dog. "Oh, oh!" Carl exclaimed from his vantage point in the tree. "Fatso is getting worried about Judas. Here he comes out of the shack with a double-barreled shotgun. Now we're in a pickle. We'd better scram. Wait a minute ... Do you hear that?" From the other side of the clearing there was a great rustling of leaves. The little fat man, who had started to follow the dog, turned around and began cautiously climbing the incline toward the federal agent's hiding place. When the man with the shotgun had almost reached the bushes at the top of the knoll, a squealing little pig burst out of them and ran toward him. "So, my little rascal, you were the one making all that racket, were you?" he commented aloud, with obvious relief, as he turned around. 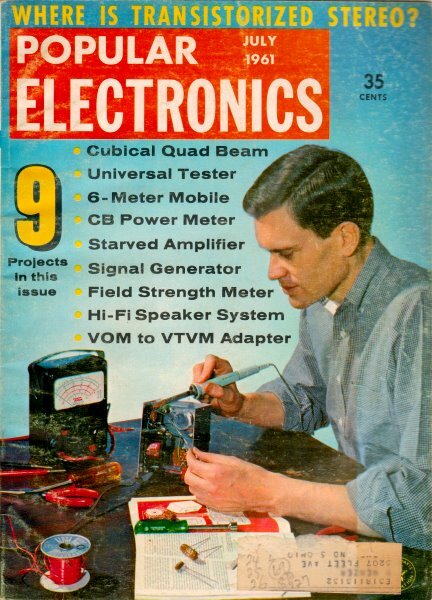 Jerry had been working feverishly, punching holes in the collar, riveting the transmitter in place, and arranging the 4 3/4"-length of black enameled wire that served as an antenna for the 100-megacycle transmitter so it could function without being noticed. He buckled the collar back in place and removed the Cap-Chur hypodermic needle. Even as he did so, the dog began to stir. The boys left hurriedly, but as they looked back over their shoulders, they saw the huge beast get to his feet and - standing with his paws wide apart - shake his head vigorously. "Here, Jude; here, Judas!" his master called. The dog turned around obediently and started lumbering toward the shack. At the same instant there was the sound of an automobile motor, and a car came bouncing out of the woods into the clearing. Two dapper men stepped out and shook hands with the fat man. Without waiting to see more, the boys returned to the place where they had left Mr. Cody. "That pig came in real handy," Carl admitted as he stretched out beside the federal agent. 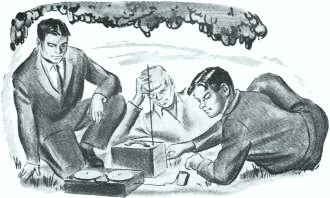 "I thought it might," Mr. Cody grunted, handing the FM receiver and the portable tape recorder to Jerry. The latter turned on the receiver with the volume down low, and instantly the voices of the three men came in faintly but clearly; and well they might. The fat man, with a visitor on either side of him, was sitting on the bench fondling the dog's ears. The hidden mike could not have been in a better position to pick up what was being said. The conversation being taken down by the little portable recorder didn't make much sense to the boys. It was all about automatic rifles, landing strips, beaches, grenades, and "our agents." Dates and places were mentioned, and the whole thing seemed intensely interesting and important to the big federal man, who scarcely breathed as he listened. Finally the two men shook hands with their host and left in their car. The little man took Judas into the shack with him and began rattling pots and pans. The three observers slipped quietly away through the woods. "Goodbye, boys," the federal agent said abruptly as he let them out of the car at Jerry's home. "You did a good job. Don't talk about what happened today - it's more important than you can guess." Without another word he sped away. "Well, that was a frustrating experience!" Carl fumed. "We couldn't tell anything if we wanted to. We don't know anything. We don't know who Cody really is, who Fatso is, what country is involved, why those men weren't arrested - "
"Whoa, slow down!" Jerry interrupted. "No doubt Mr. Cody has good reason not to tell us more than he did. And we do know one thing." "Such as how to make a dog betray his master," Jerry said with a grin.